Martin Marietta Materials is proposing to use the Arbuckle-Simpson Aquifer to provide water for washing dust from rocks in a quarry currently under construction northwest of Tishomingo, Oklahoma. The company plans to use limestone it obtains for its 300-acre quarry to make concrete rock, asphalt rock and base. Because the Arbuckle-Simpson Aquifer is the source for much of Southeastern Oklahoma’s water, many residents are worried about the sustainability of their vital water resource. Tourists currently visit SE Oklahoma from all over our state, Arkansas and Texas to enjoy the water resources in that area. With our current drought of historic scale here in Oklahoma, I can't help but fear for our already under-protected rivers. Sadly, jobs aren't exactly in surplus in that part of the state as well. It would appear that the company has managed to convince the current administration in Washington D.C. to compromise on their enviromental policies. One can only imagine how difficult that must have been. You can see from the waterline on the shore in this picture that Deep Fork is dropping lower everyday. Our state is so parched that the red water that usually flows in from the OKC area has dried up on the way. The river's water has become strangly clear. On Monday, our part of Oklahoma was blessed with spring-like weather in the 60's. Acting quickly, Dianne and I foisted off our spawn on the nearest Grandparent and headed to the river for some emergency paddling. We have both been spending too many long hours at the keyboard and not enough in the sunshine. We went back to the Deep Fork River bridges near Grayson and paddled the opposite direction as we went last time. I think we were going downstream, but there wasn't enough current to make much difference either way. Although it was a little breezy at times, for the most part it was perfect paddling weather. The sun was brilliant and there was quite a bit of wildlife out and about. We saw several whitetail deer, gray squirrels and a healthy number of turtles. One crazy carp nearly jumped in my kayak! Just like before, we found the water relatively deep for the season, slow running and much more free of logjams and debris than many parts of the Deep Fork River. The two highway bridges near Grayson make a really nice place to slip the kayaks in the water for some excercise. We both felt renewed after only few hours of paddling in the sun. On this part of the Deep Fork River, there are miles of curvy waterways to paddle up and back on. OKC is a bit of a drive for this family, but some events are just too cool to miss! Snow Tubing in Bricktown definately fits the bill. We can't wait to go slipping down the towering slide of snow recently installed at SBC Bricktown Ballpark. Stretching from the second deck to second base, this snow-tubing run is the largest of its kind in the world...right in Bricktown! There is a smaller slide for kids, hot concessions and a snowman building area. Are County Commisioners Looting Oklahoma River Resources? Members of Trout Unlimited from Tulsa have recently made complaints to at least four state agencies and the U.S. Corps of Engineers about illegal gravel mining on the Illinois River. Now it looks like some of the mining may have been tracked back to Muskogee County Commissioner Ronnie Pevehouse. Due to the recent damming of Barren Fork Creek in both Adair and Cherokee counties, and the discovery of illegal gravel mining in Delaware County on Flint Creek, Oklahoma Scenic Rivers Commission Chairman Rick Stubblefield recently decided that something had to be done. Oklahoma Scenic River supporters may be relieved to know that the commisioner has appointed a four-member Watershed Coordination and Management Committee to tackle illegal operations along the banks of the Illinois River. 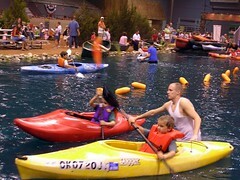 http://www.arkansascanoeclub.com/mb/viewtopic.php?t=756. A key funding source has been a local whitewater kayaking video produced by their members called: Arkayakansas. I think I'm going to buy another copy of ARKAYAKANSAS to give as a gift, so I can get one of those t-shirts...and to help out the ACC. This December OKC will be presenting a downtown parade with floats that actually float. The second annual Devon Energy Holiday Parade on the Oklahoma River is scheduled for Dec. 10. Boats decorated in holiday lights will be accompanied by fireworks along the Oklahoma River. The parade of boats will begin about 6 p.m. at Oklahoma City's Regatta Park and then travel west to Wiley Post Park. The boats will return to Regatta Park after the fireworks display. In 2004, it was estimated that around 35,000 people attended the inaugural river parade. Those who would like to enter a boat in the parade can download entry forms here or pick up one in person at Downtown Oklahoma City Inc., 210 Park Ave., Suite 230. Forms also may be picked up at metro area boat dealers. Entertainment starts at 4pm and the fireworks will begin at 7:30 p.m. Admission and parking are free! City's all over the US are getting on the bandwagon to develop their local water resources into local revenue sources by building whitewater play parks. Since Oklahoma City has been working for years to make their city more attractive to young urban professionals, creating more urban kayaking options is a natural choice. On that subject, there is a bit of good news from the Oklahoma City Outdoor Network. As of Nov 7, 2005, thanks to a lot hard work of people within the OKC-ON, Oklahoma City will be hosting the engineers from Recreational Engineering and Planning sometime in January to work on the conceptual plan for OKC's Whitewater Play Park on the Oklahoma River. OKC-ON is a great organization, I wish them the best of luck in their efforts! 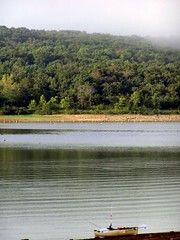 This weekend Dianne, Dylan and I are planning a short kayak fishing trip to Oklahoma's crystal clear Tenkiller Lake. Just a few weeks ago we took a trip to to Burnt Cabin Cove, a private resort on Tenkiller. This time we will be giving Tenkiller State Park a try. I have heard that the facilites are recently rennovated and I am just itching to get some hooks in the water. There are around 150 primitive camping sites at: Bluff View, Cedar Ridge, Fisherman's Point, Eagle Point, Goose Neck Bend North and South and Hickory Flats camping areas. If they aren't all already occupied by evacuees, we'll be at one of them! Tenkiller State Park is located on State Highway 82, 12 miles north of the Vian exit in Eastern Oklahoma. Stop by and visit with us, if you are in the area. Look for the big Wal-Mart tent with two kayaks parked nearby! Got any Tenkiller fishing tips? 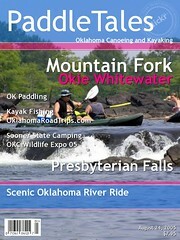 Many folks, like my wife Dianne and I, are trying to learn all they can about canoeing and kayaking in Oklahoma. One of the best resources on the web for this type of info is the Southwest Paddler website authored by Marc McCord. For a description of this excellent website's content I'll direct your to Marc's own description of his site. ...Southwest Paddler, the most comprehensive resource for information related to outdoors recreation on and near the rivers, creeks and streams of Texas, Oklahoma, Arkansas, Missouri, New Mexico, Arizona, Colorado and Utah. You really can't beat Marc's site for detailed info on paddling this part of the country. I will consider this site quite a success, if it can approach Southwest Paddler in its utility. Stinchcomb Wildlife Refuge, near OKC is considered best for paddling when the local North Canadian River (AKA Oklahoma River) flow gage is at or above 1240 feet. It looks like the paddling is geting good at Stinchcomb! The Stinchcomb Wildlife Refuge lies north of Lake Overholser and follows the North Canadian River past Morgan Road in Yukon. It contains over 1,000 acres that haven’t changed much in the last 150 years. Hundreds of birds, small mammals such as beaver, and deer make their homes in the refuge. Just make sure you have your Oklahoma City Boat Permit ($5.00 per day or $25.00 per year), you can buy then at a number of locations just call 405-297-2191 for a listing of vendors. Everyone interested in having a whitewater park built in Oklahoma City should show your support by attending an upcoming meeting to request that the city help fund a feasibility study of the project. The meeting will be held SEPTEMBER 27 at 1PM. To learn more about the effort to establish a serious paddle sport attraction in OKC visit Horton's OKC Water Park Blog. Looking for a Book To Learn About Kayaking...Fast? Keep your eyes open for excellent new kayaking book. Basic Kayaking, an innovative kayak instruction book co-written by Nantahala Outdoor Center's paddling school director Wayne Dickert, a former Olympian and 10-time qualifier for the U.S. Canoe and Kayak team, hit bookstores this summer. Dickert began instructing boaters at the NOC in 1986 and later introduced the innovative Rapid Progressions boating clinic, which guarantees that students learn important skills. Wayne's 96-page, spiral-bound book, Basic Kayaking (only $13.57) is filled with step-by-step photographs, illustrations and text detailing gear choices, basic water reading and paddling instruction from the most basic of lesson - picking up a boat correctly - to more complex lessons like learning to surf waves. Like Oklahoma, Kansas has not exactly become well known for it's great paddling spots. In fact, the entire city of Wichita only boasts one official boating access point on the Arkansas River, and it just opened in June of this year. All that may change in the future as the Wichita City Council is considering funding a study to create better access to the river for recreational uses. They are thinking about putting access points on the Arkansas River every five miles to encourage more kayakers, canoeists and boaters. A joint meeting was held recently between the Edmond Fish and Game Commission and the Edmond City Council to discuss development opportunities for nearby Arcadia Lake. Both the commission and a separate ad hoc committee of city officials have been working the last several months to find new ways of expanding the development and amenities at Arcadia Lake. The city is preparing to send out a second request for proposals nationwide to see if it can find a private partner willing to build a marina and possibly a restaurant and other amenities to further develop the lake. Other plans in the works are opening a road in to the lake from 33rd Street and beginning to develop the park land on that side of the lake. Hopefully, they will consider adding canoe and kayak rental on the lake or even consider a full water park bid from REP or a similar contractor. The 2005 Arkansas Canoe Club Rendezvous event is scheduled to be September 16, 17 and 18. Volunteers are always welcome and it takes dozens to put this event on. Don't feel left out just because you are an Okie, after all the ACC does have an Oklahoma Chapter (Next meeting Thursday, 8 September 2005 at 6.30 PM). Schedules, contact info, directions and much more can be found on the ACC's Rendezvous page. Free Oklahoma Canoe Trip on 9-9-2005! One of the best ways to enjoy a day of paddling, while pitching in for a great cause is to participate in a river cleanup. Outfitters supply boats and volunteers provide the hands and eyes...you could even win your very own canoe! The final Illinois River Cleanup for 2005 is coming soon! On Friday, September 9th, you can float the Illinois for free, spend time with fun people, and enjoy a free lunch, all while lending a helping hand to our local environment. This cleanup will help to get our river in great condition after all of the summer`s activity. Come out and enjoy the prize drawings after a day on the river and a hearty lunch. Hope to see you out there keeping Oklahoma Scenic Rivers...well...scenic. The weekend Dianne, Dylan and I ventured up to OKC to attend the 2005 Wildlife Expo put on by the Oklahoma Department of Wildlife Conservation. The OKC Outdoor Network (blog) got their members to loan out their kayaks and canoes, plus sent out volunteers to help newbies get a taste of paddle sport. The kids seemed to love it! The expo is put on to introduce Oklahoman's, especially young folks, to the great fun to had in the great outdoors of Oklahoma. With the help of an army of volunteers, they gave demonstrations, lectures and hands-on training in fly fishing, archery, kayaking, tracking, trapping, rock climbing, Bow Hunting, mountain biking, paintball, novel camping supplies and loads more stuff. I got a fun lesson on making fire the old fashioned way...with friction. Since the event was free, the lines were long...real long, but we waited patiently. Dylan got some bait casting tips and a great intro to archery. There is a movement afoot to start teaching archery in our public schools and I for one hope it is successful. On the downside, I didn't manage to get that fly fishing lesson I was hoping for and they canceled the Atlatl throwing for safetly reasons. I was looking forward to the atlatl demonstration, so it was interesting to hear about them and see the models they brought. However, I would much rather chunk one than get a lecture. Next year, I think I'm going to study the schedule a little closer and try to make it to more of the coolest demonstrations. I just learned from an Oklahoma blogger that the Turner Falls area has gotten some major rainfall recently. Judging from the picture James posted, I think I may need to personally investigate this matter. We have been getting some rain here in my area lately, but nothing like at Turner Falls. Over five inches of rain fell between Saturday and Sunday, Aug. 13-14, stranding more than a dozen campers at Turner Falls Park. Park Manager Tom Graham said Monday picnic tables are the only known casualties of the August flood. About 15 campers, however, played the waiting game, waiting for Honey Creek to recede. Anybody make it out that way for some paddling? As a guy who has always been a helpless, hopeless basket-case in the field of art, I always wished I could make things of beauty... or at least recognizable! You can make your own if you have a free flickr account (very handy if you take many pictures) and a little time. This Flickr magazine cover generator is great fun! Okmulgee Daily Times 8-14-2005 - Fishing Report. LakeFest 05 - October 15, 2005! The Skiatook Lake Association and Crystal Bay Marina are sponsoring LAKEFEST 05. Paddle on out to Skiatook Lake for an afternoon and evening celebration with tastings from two Oklahoma Wineriess and the Tulsa FOAM home brewers organization. Three live bands will feature jazz, rock, and blues. Natura Vineyards and Nuyaka Creek Winery will feature their wines.It starts October 15th 2005 at 2pm at Crystal Bay Marina point (6mi west of Skiatook,Ok on Highway 20) which overlooks 'the clearest lake in Oklahoma'. The Oklahoma City Outdoor Network gives people who camp, hike, backpack, rock climb, canoe, kayak, cycle, mountain bike and walk... a way to make new like-minded friends. They have a really informative website and now have added a brand new blog! The Trinity River Challenge is an 11 mile paddlesport race held every September to raise money for the river related causes that the Dallas Downriver Club (DDRC) supports. 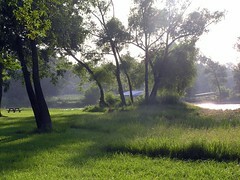 The race course is a stretch of the Elm Fork of the Trinity River between Carrollton and Lewisville TX. Originally the race was run from the bottom of Lewisville Dam to McInnish Park in Carrollton, but due to the security issues of the post-9/11 era, the DDRC is not able to gain access to the property below the Dam so the race is now run as an up and back race starting and finishing at McInnish Park. For their entry fee and participation, the racers receive a Trinity River Challenge tee shirt, a goodie bag containing various free items from the race sponsors, and a hot lunch featuring barbeque beef brisket and all the trimmings. Racers compete in a wide range of boat classes in the men's, women's and mixed divisions from solo recreational kayak or canoe out for a day of fun on the river all the way to the USCA type racing boats who are currently trying to run the course in less than one hour and thirty minutes. Dianne and I spent last night in our little Wal-Mart tent at Pelican Landing Resort and Campground near Ketchum, OK. This was our first visit to their shaded waterfront campsites on the Grand Lake O' the Cherokees, but I think we will be back soon! Although we didn't catch any fish, the facilities were excellent and we had loads of fun paddling around the Duck Creek section of Grand Lake. I definately want to return in September with my son, as I am told that Grand Lake is on the annual migration path for Pelicans. In fact, we may try to make it to the Grand Lake Pelican Festival September 23-25... I'll let you know if we see Pelicans! Pelican Landing Resort occupies 1/2 a mile of waterfront on the Duck Creek arm of Grand Lake. The camping is sort of expensive at $18.50 per night for non-members, but the bathrooms and showers were very clean, well lit, and all functioning. The have a nice pool on site, ice, a clubhouse with vending machines, A/C and TV. I mention the A/C and TV because those are the letters I miss most of all while camping! We asked about the price of memberships, but it was so far beyond what we were willing to pay that I instantly forgot the actual price. Although we paid more to camp than I ever have before, it was money well spent. Dianne and I had a blast paddling our yaks and we even enjoyed a midnight swim. 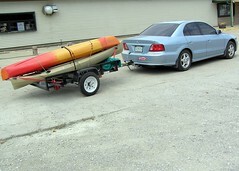 Also, this was the Maiden Voyage of our new Kayak Trailer! 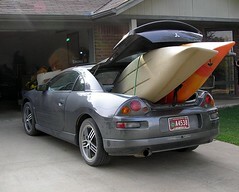 Ok, we didn't up the $700 plus for an actual kayak trailer. I was feeling kind of cheap after investing almost $300 in getting a hitch installed frum U-Haul. However, We needed a utility trailer for some light hauling and carrying the kayaks on our small cars was becoming a pain. A farm supplies franchise store who shall remain nameless, due to poor customer service and...well...I can't spell their name, sold us this trailer for around $400. It made the trip from Okmulgee to Grand Lake with no problems. Once we learn to back the trailer up, without removing it from the car, we should be in good shape! If your idea of paddling is floating around the local lakes or ponds, photography or wildlife watching on slow rivers, then you may be a recreational kayaker. Recreational kayaks make an ideal introduction to the sport of paddling. If you don't have the time to commit to paddling, but still want to get on the water, a recreational kayak is ideal. Owning a Rec Kayak can be great excercise, a fun fishing platform and immediate gratification for the inexperienced paddler. Kayaks designed for recreational use have become a favorite among paddlers interested in a more functional kayak for everyday use. These kayaks are cheaper than whitewater kayaks, easier to transport than canoes and offer plenty of room in the cockpit area to enable freedom of movement without worrying about tipping over. My wife and I enjoyed renting rec kayaks so much that we bought a couple for ourselves. We picked up a Heritage FeatherLite Angler at Academy Sports in Tulsa and a Perception Swifty from OKC's Bass Pro Shop. Each boat is about nine and one half feet long and cost around $400. Judging from the amount of money we spent renting boats from outfitters, we should be saving big money already! Sadly, the purchase of these two boats have created within us a strong desire to buy a kayak trailer to haul them on...and fishing gear...and an RV...and a kayak GPS. Treasure Hunting in Southeastern Oklahoma Oct. 21- 22! October 21, 22 is the World Wide Association of Treasure Seekers (WWATS) annual meeting at the K River Campground on Oklahoma's Kiamichi River. They hide valuable treasures and allow anyone to hunt for and keep all they find. No charge for the hunt. A $2 day use fee will be charged to enter the park for this event. And of course you will want to stay at K River Campground while attending this event. For more information visit: www.wwats.org. Regulations for use of the Oklahoma River (used to be the North Canadian River) were recently adopted by the Oklahoma City Council and took effect May 4th, 2005. The rules governing fishing, boating and trail use were developed to 'make the river recreation area convenient and safe'.